The Navy is leasing out a fleet replenishment ship to Canada, earning some rental fees while helping an allied nation. Canada agreed to pay Chile $4.8 million to use the Almirante Montt for 40 days, according to Defense News. The rental leaves Chile without its largest ship, but the 42,000-ton vessel is not critical to the Navy because it has another tanker ship, the 26,000-ton Araucano. The smaller ship was added to the fleet in 2010, when it was purchased second-hand from a company called Ultragas. The Araucano underwent improvements at the Asmar shipyard until 2013 to bring it up to the requirements to serve as a fleet tanker. Chile uses the two supply ships for joint training exercises, including some that are conducted as part of international security treaties. Canada has retired its two supply ships, and construction of two replacement vessels has been delayed until 2021. That's left Canada scrambling to find ships that can serve as stop-gap solutions. The Navy scrambled a patrol ship and a couple of aircraft after a flotilla of Chinese fishing vessels suddenly showed up in Chilean territorial waters. 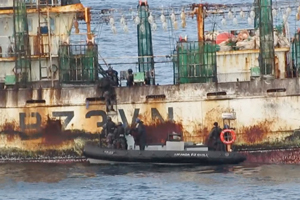 A fast-deployment force boarded the ships but found no evidence of illegal fishing, so the Chinese fishermen were allowed to continue. A separate group of Chinese fishing boats was boarded off the island of Chiloe. It was unusual to find Chinese boats that far into the eastern Pacific, and it made for an awkward situation for China, which is wooing Chile for space and military deals. Chile has an exclusive economic zone that runs 200 miles off the shoreline. Fishing and fish farming are some of Chile's most important industries, and shipping lanes are vital to the country's foreign trade. But with only eight surface warships and three offshore patrol vessels capable of reaching the deeper waters of that zone, there are plenty of coverage gaps. In fact, it was Chilean fishermen who spotted the Chinese boats, not the Navy. Several reconnaissance aircraft share patrol responsibilities, but they also seem inadequate in number to watch over an area that is five times larger than Chile's land mass. In addition, Chile has search and rescue responsibilities for an even larger ocean zone that spans about 1 1/2 times the total surface area of South America. Chile is building a fourth offshore patrol vessel, and has plans for a fifth. There are no immediate plans to add long-range airplanes. The few P-3 Orions are being refurbished extensively. An Air Force 767 jet that serves as the official plane for the president was in the news for the wrong reasons. The plane was forced to scrap a flight to a political summit in Peru after a fuel problem was detected. President Michelle Bachelet and her entourage had to board a smaller Boeing 737 to make the trip. The problem wasn't so unusual, but it was a reminder of the maligned state of VIP transports in FACh's inventory. Politicians want to find a newer, better plane, rather than continue sharing planes that are normally used to ferry troops. The Boeing 767 was purchased second hand in 2008, and it's had major problems before. Still, don't expect a VIP transport to be acquired anytime soon. A plush jet fresh out of the assembly line would be a budgetary luxury, and potentially a political backlash for any president who would board it.